There will be no Sunday Morning Bible Study this coming Sunday April 28th. Salem Lutheran Church will begin a new Bible Study for our adult members on Sunday morning May 5th. Salem’s Sunday School meets each week in various locations on the Salem campus. Sunday School is part of the Family Faith Development Hour and runs from 9:20 a.m. to 10:10 a.m. Students from Preschool to High School are invited to attend age appropriate classes. For more information you may visit Salem’s Sunday School page or contact Superintendant Laura Frank. Salem’s Tuesday Morning Bible Study is focused on the Book of Exodus. This class meets every Tuesday morning from 10:00 a.m. to 11:00 a.m. in the Fellowship Hall. Everyone is invited to take part in this class. Join Pastor Huebner, Vicar Teklu Ketema and a lively group for some weekly time spent in God’s Word of Life! This course is for students attending public schools, non-Christian private schools and home-schooled students who wish to be confirmed in the Lutheran faith. 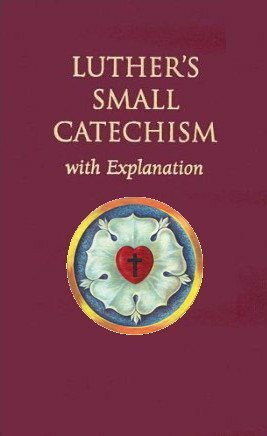 The course examines and teaches from Luther’s Small Catechism and will prepare the student for confirmation after two years of study. This class meets from 5:00 p.m. to 6:00 p.m. every Wednesday evening through next April 17th. It is led by Pastor Huebner and Vicar Teklu. For more information you may contact the church office at 314 352-4454. Salem’s Men’s Bible Study has just begun a 13 week class looking at the Gospel of St. John. This gospel was the latest written and focuses on the Divine attributes of Jesus. All men in the congregation are invited to the class which starts at 6:30 p.m. each Thursday in the Conference Room. The study lasts about an hour and all men of Salem are invited to attend. For more information please email Vicar Teklu Ketema or call him at 314 352-4454.